As House Speaker and Guinness Book of World Records Holder for Pulling Wings off of the Most Flies As a Ten Year Old, Paul Ryan struggles to keep the American Health Care Bill (aka the “Old, Poor and Insured is no Way to go Through Life Bill”) from swirling down the toilet (along with his last shred of humanity and political future), he, Trump and fellow Republican cronies are trying to shove this bill down the throats of Americans (not a covered procedure). “Obamacare is collapsing.” No, it’s not. The recent Congressional Budget Office (CBO) report which analyzed the AHCA (and found it would cause 24 million Americans to lose healthcare) also analyzed the state of the ACA and concluded that it is stable. Now who should we believe? The guy who says his inauguration (on the right) was the most attended in history or the non-partisan CBO? “The CBO’s numbers are wrong.” This is the Republican equivalent of being five years old and saying, “Nuh-uh!” Republicans have tried to rush through one of the most life-changing, wide-reaching pieces of legislation ever passed in just weeks with ZERO analysis. Yet when an analysis is finally done, they know with total surety that it’s wrong because…er…they just know, so there! How many studies have Republicans done to affirm their beliefs…oh yeah, zero. They have no facts, no numbers, no analysis to support their phony claims about the benefits of the AHCA or poke a hole in the CBO’s estimates. And let’s not ignore simple common sense. If you cut $880 billion from subsidies for poor and elderly people to get health care, a lot less of them will healthcare. Really, is that so hard to understand? Do Republicans think the poor and elderly losing Medicaid are somehow going to find $880 billion under their couch cushions? Republicans supporting the AHCA also ridiculously claim, “It’s not fair, the CBO’s not including the other two parts of the AHCA that will come later!” The truth is that Republicans don’t even have details yet on what those two parts would even be, outside of allowing insurance to be sold across state lines…which can be done today by insurance companies but isn’t because of the cost of setting up and marketing in more states! “The ACHA will give Americans more freedom and access to choose the plan that’s right for them.” Do you know “Republispeak”? In case some don’t, let’s translate all of this. “Freedom” in Republispeak means “If you can’t afford health insurance, you’re free to go bankrupt or die.” The use of the word “access” is surprisingly accurate. Just as you have access every day to lease a private jet, you’ll have access to buy healthcare. “Access” to health insurance isn’t the sane thing as “having” health insurance, which many won’t be able to afford if the AHCA passes. But at least you’ll have access to healthcare…just like you have access to Ferrari showrooms. And the Republispeak of “choosing the plan that’s right for you” translates into, “You will be able to buy cheaper plans with huge deductibles that don’t cover much and will leave you in a massive financial hole if you have a major health issue or accident…but hey, the price of the premium is a bargain! “This is just the first part of a three part plan.” No, and it may not even be the first part of anything. First, you don’t enormously slash and deregulate an industry that is almost one fifth of our economy with no analysis and only pie in the sky promises…then say that everything that will make healthcare cheaper and better will come sometime later. There’s no guarantee that any future provisions will ever pass (or even that the AHCA will) because policy changes (as opposed to budgetary/financial changes) will require 60 votes in The Senate…and it’s not likely to get at least 8 Democratic Senators to vote for a bill that completes the destruction of their President’s landmark healthcare bill…not to mention, after Democrats have been steamrolled and stomped during the Republican stampede to pass the AHCA. As mentioned above, Republicans can only come up with one thing right now that they would include in Part 3, that they claim will bring prices down and provide better insurance, allowing insurance companies to sell across state lines. But they have nothing to back up this specious claim. Nothing. And all of pre-ACA history argues against that. The second part is supposed to be all these magical, wonderful things that Tom Price, ACA-hating Secretary of Health and (in)Human Services can implement in rule changes or re-interpretations. Any big steps he tries to take will immediately trigger lawsuits since the things Republicans really want need to be legislated, not dictated. So, there is no second or third part, this is it. Like any show that bombs, the AHCA will not have any sequels. The bottom line is that the truth of what this bill really is and the destruction it would do, doesn’t support its passage. Only lies and deceptions can be used to promote it. It’s an $880 billion cut in health insurance subsidies for those who need it the most and an $880 billion tax windfall for the wealthiest Americans. Plain and simple, that’s what this bill is really about. In an America that is in the midst of the biggest divide between the wealthy and the majority of Americans, one of the key issues why Trump voters supported Trump, Ryan, Trump and their partners in crime are trying to make it so much worse. Not only would this make the gap bigger between the billionaires and 99% of Americans, it would deny many Americans even the most basic health care, literally hastening the illness and deaths of the many in the quest of making the fewer rich richer. 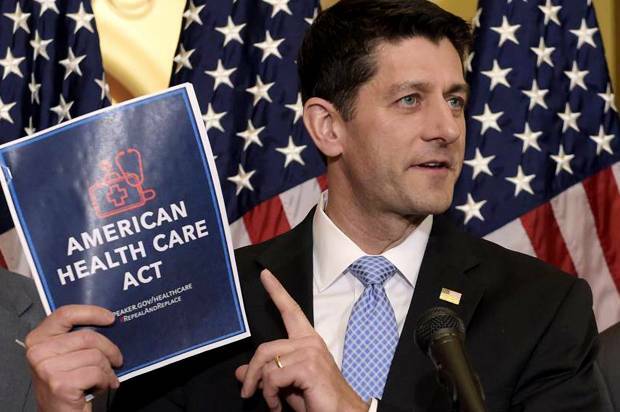 The argument could be made that if the Republicans passed the AHCA and as the CBO has forecast, 14 million Americans lost healthcare in 2018, the backlash against Republicans would be massive and could put Democrats in a position to control Congress and the White House by 2020 to pass a Medicare For All type plan. The big problem with this though is how many people could suffer and die in the meanwhile so it does seem best if Republicans choke on their reverse Robin Hood scheme now and for good. Hopefully, Democrats will win back at least one house of Congress in 2018 and Trump will lose any chance to take another whack at whacking healthcare for Americans. In the meantime, let’s not let lying dogs lie. It seems to me that the republicans claim to be the party of “Christian and family values” is worth as much as any other lie told by trump or ryan. Christian values? Family values? No and no! Their values are aimed at making themselves and their rich friends richer! Nothing else! 10 months of battling ignorance so blind it makes me wonder at my own sanity and not one time have I felt like I am gaining ground with the Trump voters I engage. Reason, logic, fact checking, nothing works. I have to keep asking myself one question, ‘do you get dumb before or after you become a republican’? I do not have the answer. Hey gyp, they don’t “get dumb,” I think they’raised that way. They’re greatly influenced by their parents, their parents friends, their churches and schools. These people tend to surround themselves with like minded others, and I suppose that’s true of most any group of people. The protect themselves from unpleasant truths and cold hard facts. Their upbringings teach them to fear and or be suspicious of anybody unlike themselves, or people who don’t follow their rigid ideologies. Trump has loosened the seals on normality, what we once thought is no longer so. I’m 70 and people I graduated high school with in 64 now are gleefully admitting their racism. This astounds me, that after the seemingly growth of the last 50 years so many were just hiding in the grass. Not only here but all over European countries as well. Do they not remember what hate did to their world just last century? It must be stopped now. Some point out just how easy it is to succumb to the thinking that ‘this too shall pass’ but that doesn’t quite ring true this time. RESIST AND IMPEACH, we must stay focused and LOUD. Hey gyp46, I think for many, they look at politics like religion. They invest their faith in Trump and will support and justify whatever he does because they are authoritarians that just want a strong man to take over and fix everything without democracy and a free press getting in the way. They justify their ignoring of truths about Trump by following his lead and just condemning the press as the enemy. I think it’s hard to get through those of blind faith, they don’t want truth, they only want affirmation. If Repubs pass the AHCA and many of these Trump voters get kicked off of Medicaid, maybe then they’ll finally snap out of it and realize they’ve been conned…but it will be too late for them then. What I think we have to do is just keep the door open for them to join us against Trump but mainly just focus on overwhelming them at the ballot boxes in 2018 and 2020 and dragging them with us towards a better future. There’s something else at work this time, this crowd who back this crook so blindly are not the repubs we knew under Reagan, GHW BUSH, or Gw. The dregs have risen from the nether world and claim victory this time. Trump incites them, he has released some vile hate I had thought we left behind, but now is glorifying in the worst inside themselves. The hole they are digging could take decades to fill. The likes of Ryan are riding a tiger they do not control. gyp46, very incisive. I do agree that within the core of Trump voters is an ugly mob-like group of hateful racists and ignorant anarchists. They have crawled out from under their rocks, safe in the shadow of their Slime King but as you say, the mistake has been in the GOP establishment thinking they can control them to accomplish their elitist and plutocratic goals. These people are unhinged and driven primarily by their fear, hatred and prideful ignorance. I would add though that there is a segment of Trump voters who are not part of this group of horribles, they might have trusted Trump’s promises, didn’t like or trust Hillary, made the mistake of thinking electing Trump would send a message to the establishment that they feel has ignored them, etc. The horribles are permanent fixtures and have been throughout our history but they are usually beaten and they will be again in the next two elections. They offer nothing but hatred and destruction and as people see that their candidate is reflecting that (plus corruption and greed), I think those who weren’t strong Trump supporters will pull away from him. If that does happen, and we do have to keep the door open for those folks to come our way and vote for Dems, I think we can crush the horribles next year and in 2020. Meanwhile, as we’re seeing with this terrible Trumpcare/Ryancare bill, the GOP will tear itself apart with its intolerance, intransigence and hostility. I must say, it’s good too see the hatred of the RW extremists turned against the GOP and its bills for a change…but we have to take them oon and beat them next year!